Nick Sampson Mechanical Engineering in the UK saw the benefits of adding a Mercedes-Benz Arocs 3363S to its fleet. 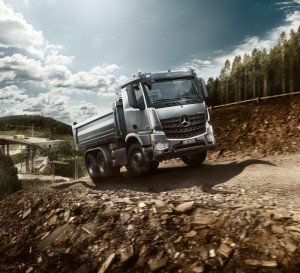 The 155 ton Arocs receives its 626 horsepower and its incredible 2,213 pound-feet of torque from the 15.6-litre inline six-cylinder engine mated to a 16-speed automatic transmission. That large amount of torque allows for workers to haul up to around 80 tons of equipment up steep inclines. The company decided to go with the Arocs because of its cost-effectiveness and its flexibility for multiple business operations. The versatile turbo clutch allows for the Arocs to do various jobs. Silver Star Mercedes-Benz Montreal understands the benefits that the Arocs can provide to many business operations similar to Nick Sampson Mechanical Engineering.